Polycarbonate – the new glass? If polycarbonate had been invented before glass, then it would probably be today’s glazing material of choice. In its solid form it looks like glass and it’s a safe product that offers many benefits for modern day glazing applications. This sustainable and long lasting material lets the light through, it’s less than half the weight of glass and it’s virtually unbreakable. No danger of breakage during transit, installation or use, due to its inherent strength: a safer material both during installation and in-situ. Virtually maintenance-free: fit it once and forget it. Polycarbonate retains its properties at both high and low temperatures – so no problems from cracking. In refurbishment projects its light weight helps to reduce the strain imposed on the fabric of any building, helping to extend the life of said building. Fitted within our own Multi-Link-Panel NF (Non Fragile) the use of polycarbonate glazing also makes a significant contribution to compliance with working at height regulations. Installation time costs money and possession times are usually very restricted. The modular Twinfix Multi-Link-Panel NF has a unique fixing method that means installation takes less than one third of the time of a traditional split bar glazing system. This obviously helps to make the most of limited possession – and the fact that the panels are built and glazed off-site means less opportunities for expensive site mistakes to occur. You can choose from multiwall and glass-clear grades or a Georgian wired glass lookalike that passes heritage requirements. The aluminium framework may be powder coated to match your colour scheme. And as a bonus, both the aluminium and the polycarbonate may be recycled at the end of their long life span. With safety being a main concern on any building site nowadays it is imperative that specifiers do their best to ensure that items fitted and used at height are as safe as possible, especially rooflights. According to the HSE: “Falls through fragile roofs and fragile roof lights cause death and serious injury. They account for almost a fifth of all the fatal accidents which result from a fall fromheight in the construction industry.” Use of the Multi-Link-Panel NF, that conforms to the ACR[M]2011 drop test, goes a long way towards achieving a higher level of safety, both to anyone working near to rooflights, and to those who gain unofficial access on to such a roof. 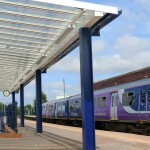 In recent years Network Rail asked Twinfix to design an access hatch for use within the Multi-Link-Panels they specify on many station canopies. The key to this hatch is that it is very much in-line with the glazing so it looks similar to the rest of the roof, great for heritage areas. This is now in use and enables staff to safely clean a glazed roof and its gutters from below. 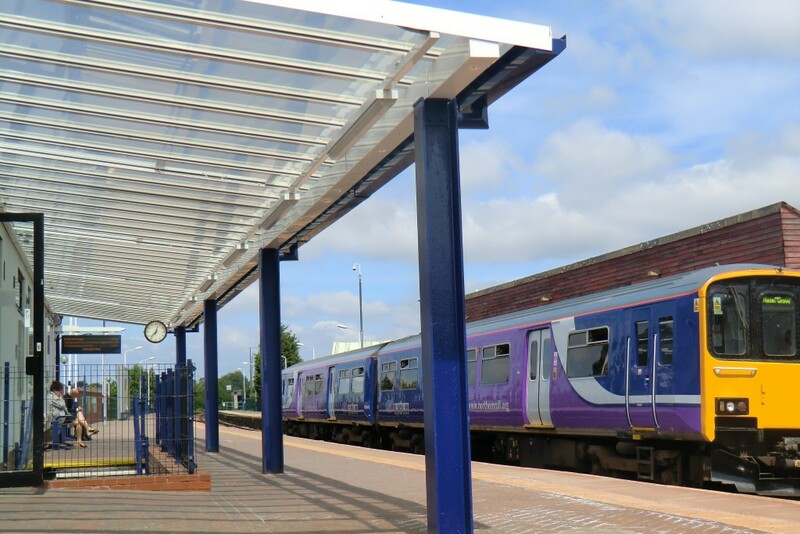 Whereas in the past it was thought that polycarbonate was not suitable for use in older, more traditional stations, nowadays it is widely recognised as an advanced building material that is most appropriate for these locations. Our new Georgian wired effect polycarbonate makes a great modern day replacement for damaged Georgian wired glass. Polycarbonate glazing is used widely across Europe, in stadia and railway stations where it stands out for its key money saving advantages as well as its architectural merit. As a material that is easy to handle, install and unlikely to break in situ, polycarbonate offers great longevity. With design life of products so important nowadays, polycarbonate is a key building material in the rail industry.